Constructing and programming robotic devices have been some of the highlights for year 8 and 9 students in the YES Centre this year. Students have been studying the hardware and software aspects of robotics, as well as computational thinking skills. YES teacher Mr Ravin Girdhar said students have not only learned how to build them but also to use them to problem solve. “This introduction might lead them into doing lessons in the new STEM (Science, Technology, Engineering Maths) Centre in the future,” Mr Girdhar said. Student Andrew said he had found robotics interesting. “The best part is creating, building and coding because it’s something I could really do in the future,” he said. “In the future robots are going to do human work and they will need someone to code them and program them. 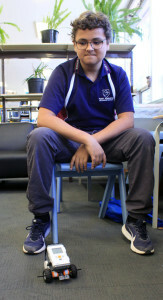 Another student, Narjic, said he enjoyed the subject and his favourite part was constructing devices using Lego. “We built little robots from Lego that followed instructions through programming,” he said.